Zoo Careers Zoo more with your career! From animal care to administration to horticulture and everything in between, there are many opportunities to pursue your career goals at Nashville Zoo. To apply for a job at the Zoo, click the link below to browse our current openings and submit your application. New positions are added as they become available. Thank you for your interest in an internship or externship with Nashville Zoo. Our program provides an opportunity for college students and recent graduates to acquire experience and knowledge by working alongside our Zoo staff. Although our internship/externship positions are not paid, the experience is no doubt a benefit for future endeavors. Please note, we cannot accept international students at this time. You will be asked to upload your cover letter and resume on the last page of the online intern application (next step). Our application system is undergoing maintenance. Applications for the fall will reopen June 1. One letter of recommendation should come from a representative of the school you currently attend. 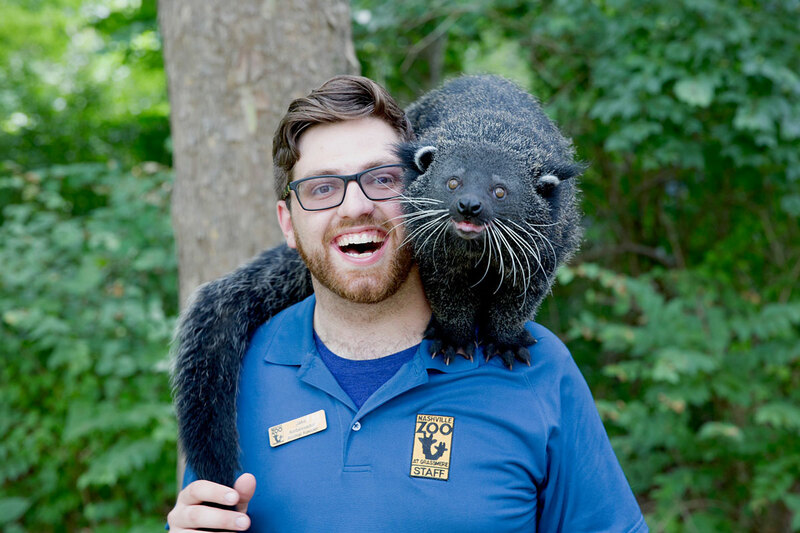 Email both of your letters to intern@nashvillezoo.org. Upon receiving the completed application, selected students will be contacted to schedule an interview. Efforts are made to place students in their area of interest, however sometimes this is not feasible. The Ambassador Animal Intern assists in the care and maintenance of the education animal collection and in the presentation of educational animal shows and programs both on and off Zoo grounds. This collection includes a wide variety of arthropods, mammals, birds, reptiles and amphibians. The Avian Department is offering an internship focusing on the day-to-day care of the avian collection across the Zoo. The intern will rotate through multiple areas from large exhibits, like flamingo and lorikeet, to smaller behind-the-scenes breeding areas. The Commissary Intern assists in the dietary preparation and general cleaning of the kitchen, coolers and grain room. The Intern will gain an understanding of animal nutrition and what it takes to support the animal operations of the Zoo. The Ectotherm/Aquatics and Herpetology department is offering an internship for an undergraduate or graduate student with a strong interest in Ichthyology and Herpetology. The intern will assist in the care and maintenance of the animal collections housed in the Aquatics and Herpetology department. The Mammal Department is offering multiple internships across the department. Interns will be assigned to one team within the department: Hoofstock, Contact Area, Primate, or Carnivore Teams. Interns will work alongside keepers in the day-to-day animal care routines for a variety of animals. Nashville Zoo offers unpaid veterinary internships for both undergraduate and graduate level veterinary science students, as well as post-graduate Vet Tech students. All veterinary internships are 40 hr/week with some weekends on call. Students will work with the Zoo's veterinarians, veterinary technicians, and hospital keepers. Students will research upcoming and current cases and assist with preventative and emergency care. Students will give a presentation at the end of their externship on a current, pertinent topic or the student's research project. For information on Veterinary Internships, please contact Melinda Kommavongsa mgilbert@nashvillezoo.org. Submission deadlines for Veterinary Internships vary from those listed for other internships. Please note, Students are responsible for providing their own transportation as well as housing. A $10 program fee and proof of negative TB test (within a year) will be required upon starting. Please note, ALL 2015 Pre-Vet/Undergraduate and Vet Tech internships are full. Nashville Zoo offers veterinary internships for both undergraduate and graduate level veterinary science students, as well as post-graduate Vet Tech students. For information on Veterinary Internships, please contact Melinda Kommavongsa mgilbert@nashvillezoo.org. Submission deadlines for Veterinary Internships vary from those listed for other internships. 4th year clinical applications are accepted at any time. The Business Development Intern will have the opportunity to assist with projects in the Development Department that may include: maintaining the Zoo's donor database, prepare donor acknowledgments and mailings, and assist with the planning and execution of Sunset Safari, the Zoo's annual fundraiser. The Event Specialist Intern will directly assist the Director of Special Events, Event Operations Manager and Events Coordinator. Interacting with clients and business partners such as onsite catering, SSA, may be required. Responsibilities to include but not limited to: event logistical planning and research, event preparation and set-up, event day responsibilities including oversight of volunteers, area set-up and problem-solving as needed, event break down, general event duties including birthday party assistance and light administrative duties as needed. The Historic Site intern will have the opportunity to assist with projects at the Grassmere Historic Farm that may include: exhibitions, research, collection management, planning and design, special events, education, interpretation, and volunteer and visitor services. The Human Resources Intern will have the opportunity to apply their experience to projects that may include: payroll processing, 401K programs, benefit programs, and employee assistance and training. The Marketing and Public Relations Intern will have the opportunity to work closely with the marketing team to assist in a variety of projects that may include: archiving the Zoo's media, event support, photo and video assistance for digital platforms, and management of the editorial calendar and social media accounts. The Onsite Interpretation Intern assists in the research, creation, implementation, and delivery of public interpretive programs at Nashville Zoo along with the training of volunteers in public program delivery. The School Programs Intern will have the opportunity to work closely with the School Programs Manager to assist in a variety of projects that may include: development, facilitation, and evaluation of education programs, lesson plan editing and design, and development of content for education resources.